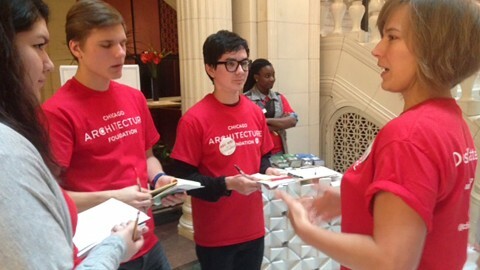 Curious or unsure about volunteering for the Chicago Architecture Center? Here are a few frequently asked questions to convince you to join us as a volunteer! With the exception of our OHC volunteers, volunteers are required to serve 30 hours per calendar year. Shifts are available seven days a week and scheduling is flexible and based on your availability. How much training is required to volunteer? Training varies depending on the volunteer position. All volunteers attend a two-hour orientation session followed by specific training for their job. The minimum training for any of the positions is two hours. Our docent volunteers participate in a nine-week training course. All training is conducted by CAC staff and experienced volunteers. What if I choose to leave docent training before I finish? If you are accepted into the docent training class and voluntarily leave the program after it starts, the CAC will request reimbursement of $350 in training and materials costs. Do I have to become a member of the CAC to volunteer? Each volunteer is required to become a member of the CAC. After your first calendar year of service, you will receive a free individual membership, provided that you’ve completed your 30 hours of service. Who are your typical volunteers? Our typical volunteers are passionate about architecture and Chicago history. They are usually outgoing and enjoy working with people from all over the world. Do I need access to the internet to volunteer at the CAC? Yes, most of our communications are digital and all of our scheduling is done online. Do I have to be an architect or designer to volunteer at the CAC? While professional experience is celebrated, there is no need to have professional design experience.